Goodbye processed nuggets. Hello veggies for picky eaters. Having been around my fair share of kiddos, I’ve found that even the pickiest eaters seem to like “nuggets”. They are an American kid food staple. Unfortunately, most of these nuggets are highly processed, and have very little nutritional value. Why feed our kids food empty of nutrition? I like that you can make these for dinner and recruit your little ones to help shape or bread the nuggets. In addition, they are perfect for the lunchbox since they are just fine at room temperature. 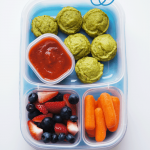 If you need more lunchbox ideas, click here. We’ll email you some. 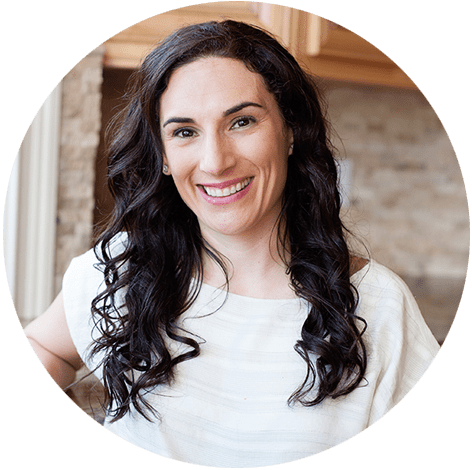 Today I am going to be sharing a recipe for nuggets with you. I apologize in advance for them not being shaped like dinosaurs, but instead they are packed full of veggies and fresh ingredients. I used a cookie scoop to shape them but you could easily make them with your hands. To make them, you start with ½ large cauliflower and 1 broccoli crown. 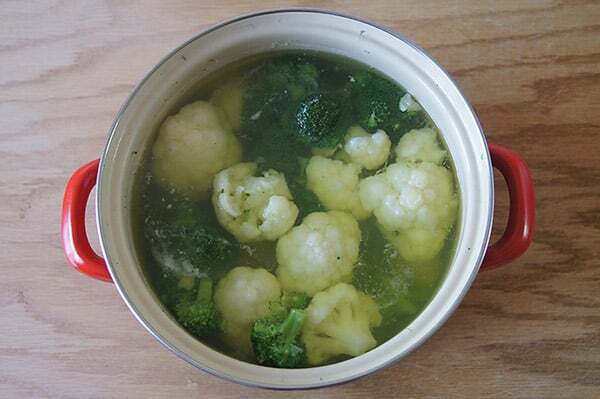 Boil your cauliflower and broccoli together, until they are cooked and soft (about 10 minutes). Remove from water and rinse in cold water to stop the cooking process. Place cauliflower and broccoli inside a food processor and process for a minute or two, until it’s thoroughly combined. Add eggs, breadcrumbs, Parmesan cheese and seasoning to the veggie mixture. Process a few pulses until evenly combined. If veggie paste is too sticky, add additional bread crumbs. This will vary based on the size of your broccoli and cauliflower heads. Using a cookie scoop (you can use a 1 or 2 Tablespoon cookie scoop, depending on how big you want your nuggets to be), place veggie nugget scoops onto a parchment line baking sheet. Once they are cooked, they look like little macaroons. My kids liked to dip theirs in marinara sauce. These also freeze very well. All you do is place uncooked nugget scoops onto a baking sheet, and place them in the freezer. Once they are frozen, you can store them in a gallon freezer bag. On busy nights, pull them out of the freezer, preheat oven, and bake an additional 2-3 minutes. 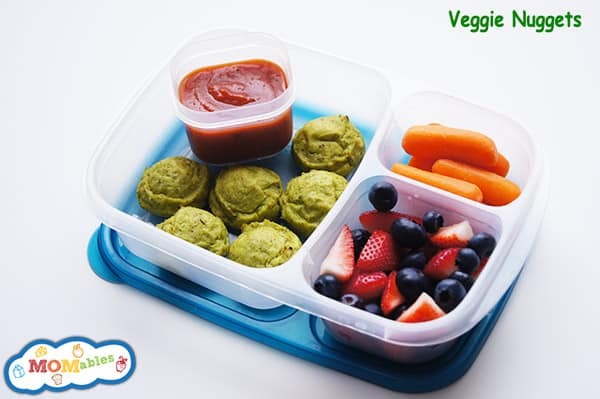 These veggie nuggets are great to send in your child’s lunch. In the microwave, lightly steam veggies. Or, boil your cauliflower and broccoli until they are cooked and still slightly crispy. Remove from water and rise in cold water to stop cooking process. Place cauliflower and broccoli florets inside a food processor. Process for a minute or two until it’s thoroughly combined. Add eggs, breadcrumbs, Parmesan cheese and seasoning to veggie mixture. Process a few pulses until evenly combined. If veggie paste is too sticky, add additional bread crumbs. This will vary based on the size of your broccoli and cauliflower heads. 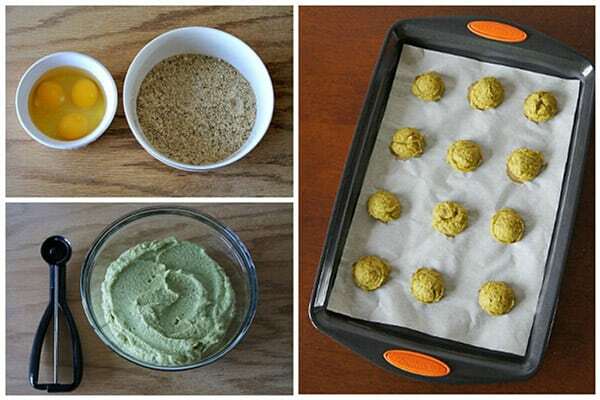 Using a cookie scoop, place veggie nugget scoops onto a parchment lined baking sheet. Bake for about 15 minutes until golden brown. Some people have complained that the nuggets seem undercooked even when baked at a longer time. This is because veggies were overcooked when boiled. They need to be cooked but still slightly crispy, not soft. To freeze: Place uncooked nugget scoops on a baking sheet. Once frozen, transfer to a freezer bag. To bake again, preheat oven and add 2-3 minutes to baking time. Is there a substitute your could recommend for egg wash? My son and I cannot have eggs. Tiffany, you can omit the egg wash. Enjoy! Can you freeze these cooked? Yes! Simply reheat them in the microwave or the oven when you’re ready to eat. Do they need to be refrigerated? My husband left them out over night after cooking them :( should I pitch them? while I don’t knot your kitchen temperature, I advise that leftovers are refrigerated. So sorry! Could you NOT steam the veggies first?? Seems like it’s just cooking it twice? Maybe that would help with them being too mushy? Anyone tried this? Disappointed. I really don’t think I overcooked my veggies, but the nuggets have the consistency of mashed potatoes and the flavor is just okay. My kids tried them and had a good attitude, but none of us cared for them. I may try again but steam the veggies in the microwave to be sure they’re very al dente. I had the same problem as two others who commented – after 15 mins, the outside was barely browned and the inside was still mushy. So I cooked them for ten more mins, only to have put them back in for ANOTHER 10 mins after that. The outside ended up browning but the inside never changed, it would be steaming hot inside but the texture was still like wet dough. Not sure what went wrong. Perhaps it’s possible to overmix, like you can accidentally do in baking things like muffins, where the dough becomes too dense? I had a hard time deciding if the egg was actually cooked or still raw like the consistency made it appear. But since it was steaming hot when I cut them open after 35 mins, then I would only assume it’s thoroughly cooked. Thoughts? Emma, this might be because the veggies were overcooked. they need to be a bit “al dente”. I just revised the notes in the recipe. The egg was definitely cooked through. don’t worry! I made these tonight using some shredded zucchini I had in the freezer plus some sliced potatoes that were in the fridge. I don’t know how the quantity of what I had compared to Laura’s recipe. Because of this I had to estimate the appropriate quantity of the other ingredients to get the right consistency. Even though I think I added way too much in the way of breadcrumbs, they were a big hit at dinner. next time I will make sure I taste them before putting them in the oven (raw eggs be darned) to see if I need to adjust the seasonings. I’m putting these in the kids’ lunch boxes for tomorrow! so glad these turned out ok Jenny! Did you cook the zucchini first? Thanks! I just tried making these and they did not firm up. The dough did not seem to sticky or wet or anything. I ended up cooking them for half an hour and they were still goopy. Do you have idea what I could have done wrong? I love the taste of these, but the texture was off because of something I did. But I will be trying this again!! I made these tonight, easy and delicious. Great recipe, thank you. 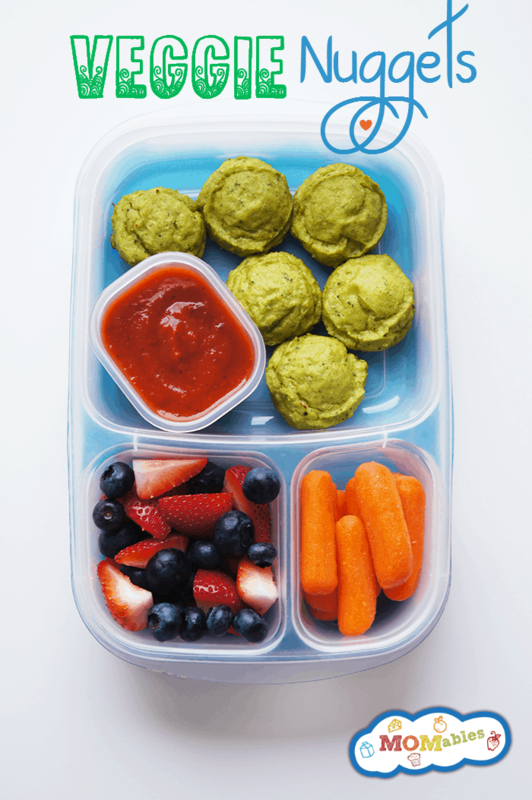 Next time you make them – could you weight the uncooked broccoli and cauliflower to give us a ballpark on the size? 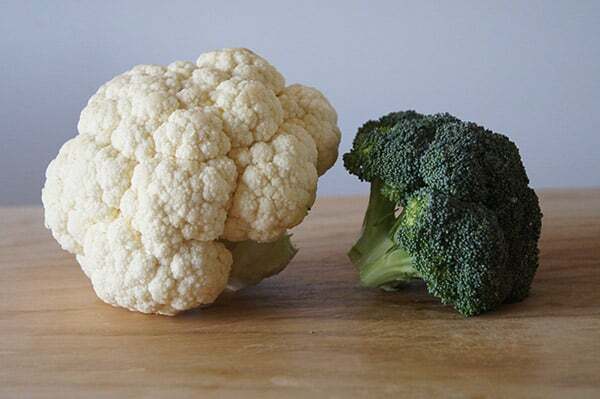 The cauliflower I see around here tends to be bigger than you show and brocoli smaller. I would be interested in that too! 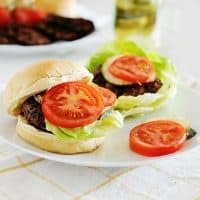 What could you substitute to make these dairy free? Nutritional yeast? I have not tried making this dairy free. the parmesan cheese helps bind the nugget together. Is there something that could be substituted for the breadcrumbs to make these grain-free? Almond meal? Mary Jo, try 2-3 Tablespoons of coconut flour up to 1/4 cup. wait for it to absorb the moisture. prior to baking should be a thick paste like dough. Where do you get the container in the momables pic? And also the little dipping container? Does that fit there with the lid closed? Thanks for the recipe. I’m going to replace some of the breadcrumbs with cooked quinoa. Perhaps maybe even replace all the breadcrumbs to make this gluten free. Just made a double batch. For comparing… With the broccoli, cauliflower & 6 eggs in the food processor, it was over flowing. I just scooped out half of the mix into a bowl. Added 2cups of bread crumbs, 1cup cheese, seasoning & mixed it up. Then just dumped the food processor stuff into the bowl and stirred to combine. I then added breadcrumbs to resemble a dense mash potato that you can cut a strait line in. :) They taste better if they are more dense than not. Both kids LOVE them and I just called them Pizza Bites. You could really add to this recipe and change up the flavors a bit, but they are great the way they are. :) Thanks! Thanks for letting us know how well these worked out for you Lori! I used a bag of Californix Mix frozen veggies and shredded parm (it’s what I had on hand) and I did have to add extra bread crumbs. My five year old LOVED them, as did I. I think I may even get my husband to eat some veggies this way, he’s my pickiest eater : )! What should the texture be inside? I tried one after 20 minutes because they weren’t browning after 15, and it was just a mushy texture. the texture is “nugget”like… hush-puppy like. I’ve cooked mine almost 25 minutes and they are still mushy inside. Not close to hush puppy. Any idea what I did wrong? I told my daughter that really doesn’t like green food that they were Mike Wizowski Monsters Inc. Nuggets and she didn’t bat an eyelash at the color. We’ll be making these regularly in our home. Thanks for sharing such a fun recipe! These are delicious! My 4YO loved helping me make them. He not only asked for a second helping when we made them as part of dinner one evening, he even asked to have them for lunch the next day. A big hit for sure! Can’t wait to try, souds delish and hope my picky 4 year old will eat it. Do you by any chance have a recipe for a good homemade marinara sauce? The eggs seem to be the binder- is that correct? We have an egg and dairy allergy in our family and I’m thinking maybe flax eggs would work well in this recipe. Are they good cold? Thinking they would be great for school lunches, but my daughter doesn’t have access to a microwave so they would be eaten cold. Kat, yes. You warm them up in the morning and they are meant to be eaten at room temperature. If they are going from freezer to lunchbox do they have to be baked for a couple minutes first? If you were allergic to broccoli, what would be a good substitute (both texturally and nutritionally)? Spinach or Zucchini? Oh yeah, for sure making these!! Great recipe!